I was recently asked how to move the Create New Case button from the Case ribbon to the Queue ribbon. I was initially sceptical of this being possible, but after a little investigation found that in a roundabout way it is. 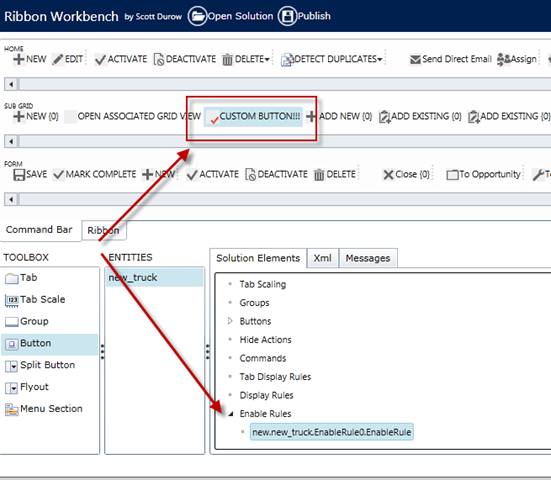 In this post I will demonstrate this approach but with a more widely applicable scenario – I will add a collection of quick create buttons to the Dashboard ribbon. And I’ll demonstrate the process using the awesome new Visual Ribbon Editor from Erik Pool (thanks mate, you are a rock star!). 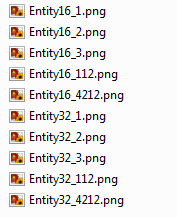 So, instead I will find the individual entity images CRM uses and use those. I will come back to that later. I originally thought I would see the button calling a CreateNewCase function. 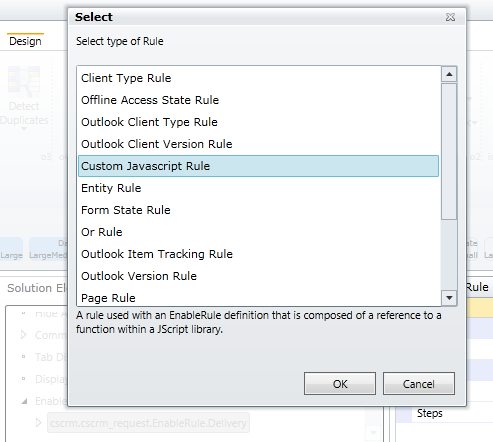 Instead you will see Microsoft have designed a generic function that the new button on each entity can call passing in a unique entity identifier parameter to control which entity form is popped. To replicate these buttons on the Dashboard ribbon we can call the same function and explicitly specify the entity identifier. We are heading into unsupported territory here and there is a risk this solution won’t work after an upgrade but it’s an easy change to undo and if you needed to find an alternative approach in the future it wouldn’t be hard, this way is just the quickest. 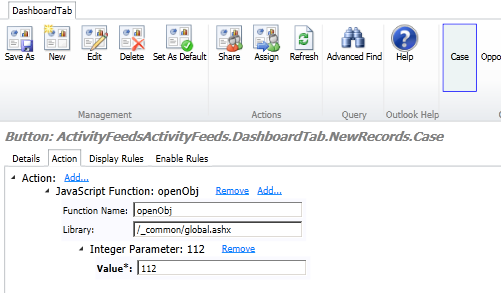 Repeat for each additional button, entering their unique identifier (Object Type Code from the Meta Data Browser) in as the Integer Parameter value. That’s it. You could go on and add language translations and display rules for the buttons but I won’t go into that here. 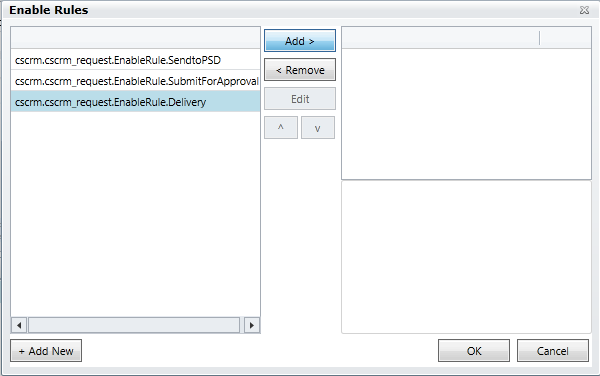 To migrate this customisation to another environment simply include the Application Ribbons component in your Solution file. If you would like a copy of this customisation I have a solution file available here. This entry was posted in Uncategorized and tagged ribbon on January 12, 2012 by Gareth Tucker. 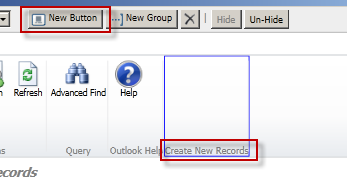 Here’s a quick run through on how to add a new Group of buttons to the ribbon in Microsoft CRM 2011. 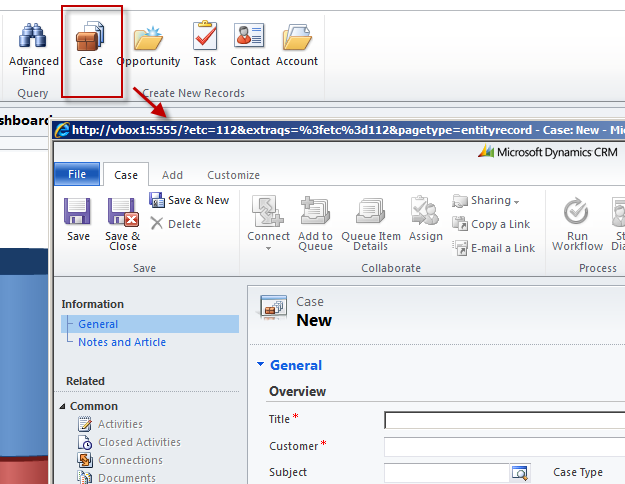 In this scenario we are customising the Phone Call entity’s Form ribbon. In particular the Main Tab of that ribbon (the tab that carries the name of the Entity). To implement this change we need to customise the Phone Call entity. 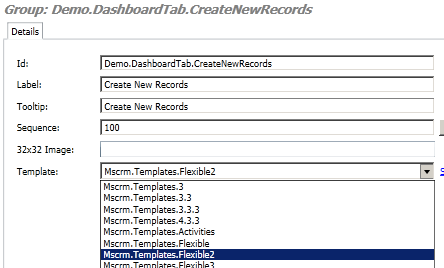 At present CRM does not provide a UI for Ribbon customisations but the customisation XML does support these changes. So we need the Phone Call entity’s customization xml. 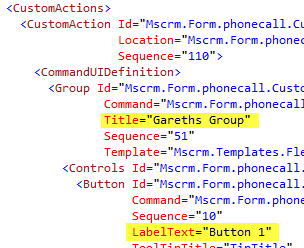 Create a Solution, add the Phone Call entity, export the solution, unzip and then open the customization.xml file in Visual Studio. The first Custom Action adds the new Group and the 2 Buttons inside that Group. The second Custom Action adds the MaxSize definition for the Group to the Scaling definition of the Ribbon. 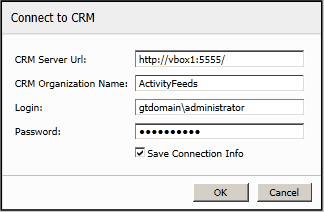 This tells CRM how to display the buttons when the screen size does not require any collapsing of the buttons. The third Custom Action adds the Scale definition for the Group to the Scaling definition of the Ribbon. This tells CRM how to display the buttons when the screen size is insufficient. Do a Find and Replace on “phonecall”, replacing with the name of your entity. That’s all you need to change at this stage. We’ll come back and personalise other settings in a sec, let’s just try and get the button group to appear first. The first Command Definition defines what should happen when the first button is clicked. I just have a hardcoded URL being launched. The second Command Definition defines the 2nd button’s action. And the third Command Definition defines when the Group of buttons should be enabled and visible. You can alternatively set these rules per button. You’ll see I am referring to a rule called “Mscrm.ConvertActivity”. I got this from the phonecallribbon.xml. This is the rule used for the Convert to Case button. I find it’s handy to just steal the rule of another button who’s behaviour you want to mimic. And find a Display Rule and Enable Rule in your entity’s ribbon.xml that you can use. You can’t just use my “Mscrm.ConvertActivity” rule as it may not exist on your entity. To adjust the appearance you can now go back and tweak some of the XML attributes (after which you would re-zip, import and publish). That should be enough to get you going. Hope this helps someone. 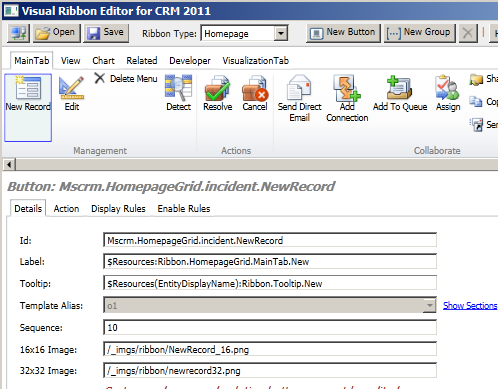 This entry was posted in Uncategorized and tagged 2011, crm, ribbon on August 24, 2011 by Gareth Tucker. 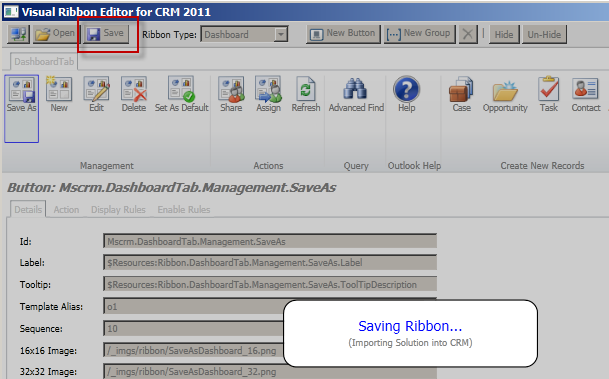 In my previous posts I provide an introduction to working with the Ribbon in CRM 2011 where I demonstrate how to add and remove buttons. In this post I will explain how to edit existing buttons. Always make sure you are looking at the right Tab as similarly named button may appear on the SubGrid tab and HomepageGrid tabs as well. 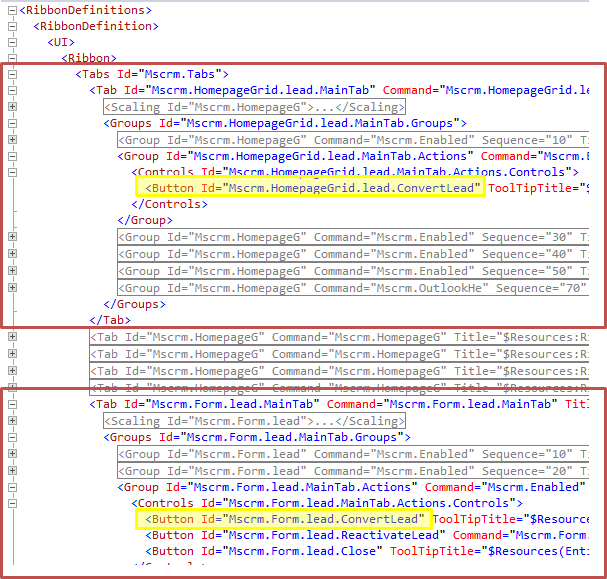 The lesson for first timers I want to reiterate here is DO NOT change this XML file. It will have no effect. 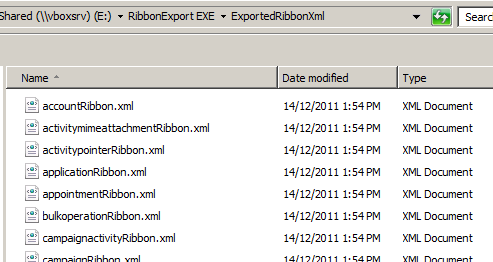 This file is essentially documentation of the out-of-the-box CRM ribbons it is no way used by CRM to render the ribbons. To change the ribbon we need to make entries into an exported customization.xml file that contains the definition of the Entity involved. Reads as: “I want to perform a Custom Action, lets call my action GT.switch.button.sequence1. 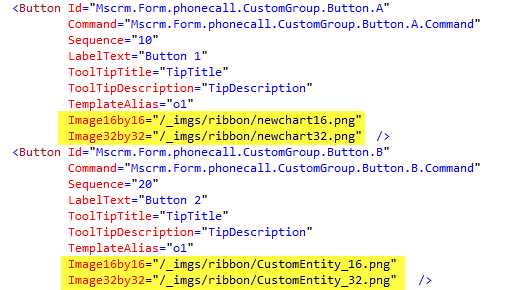 I want to change one of the child nodes in the ribbon definition under the node that has the Id: “Mscrm.Form.phonecall.MainTab.Convert.Controls”. Here we are defining a button. Now what I did here was I copy and pasted the definition of the Convert to Opportunity button from phonecallribbon.xml into this customization.xml file. I then changed the properties that I wanted changed. Specifically I changed the Sequence so that this button would be rendered after the Convert to Case button (which has Sequence 20) and I changed the TemplateAlias to o2 so that this button will be rendered as a little button. I think this is important as this button group has been defined as 1 big + 2 small button group and I don’t want to defy that. Those are the only 2 items I have changed. Because the Id I have specified for this button matches an existing button CRM knows to merge my definition with its existing definition and overwrite it’s definition with mine, rather than creating a new button. In my XML snippet in addition to the above I have a second Custom Action containing a second button definition where I specify the overrides I want to the Convert to Case button. Each button definition needs to sit under it’s own Custom Action header, hence this structure. That’s it. 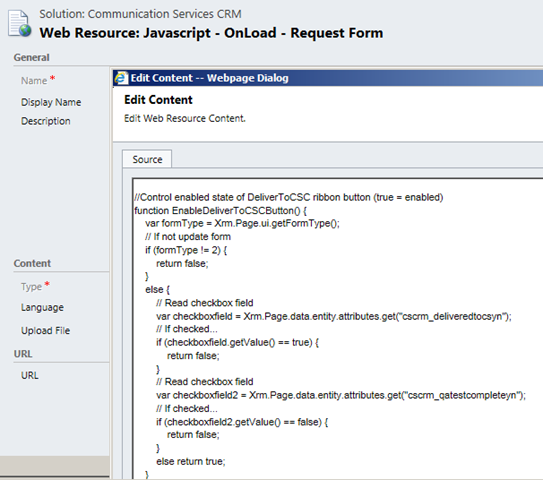 To deploy we simply zip back up the customization.xml file along with it’s other solution files and then import that solution zip file back into CRM and Publish. You can follow this same approach to change buttons icons, button labels, etc. .. and have a look at the ribbon definition for the entity involved. In our case this is the file leadribbon.xml. There are separate ribbon definitions for: the main grid view of an entity, the related grid view, and the form. In our case these buttons appear on the main grid view and on the form but not on the related grid ribbon, so there are 2 changes we need to make. Ribbons are defined as a collection of tabs. Each tab has Groups. Each Group has buttons. This entry was posted in Uncategorized and tagged 2011, crm, ribbon on February 23, 2011 by Gareth Tucker.